I’m not sure about any of you, but I can honestly say that Kris Jenner has finally reached media saturation. She must think that she is so cool and on top of the world, living the way she does, but honestly, I have had enough! Who’s with me? 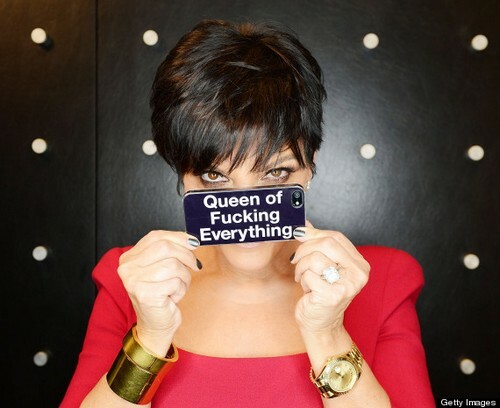 Kris is obviously not above taking selfies of her iPhone showing that she is the “Queen Of F*cking Everything”. Heh. We are NOT amused. Seriously, who does this broad think she is?!? The only way I am going to buy this iPhone sticker coming from this idiot is if it’s to be taken literally. Like she is the “Queen” of literally f**king everything that moves….then it would be comical. Otherwise, she’s just being a pretentious twatwaffle. Perhaps we should consult the diaries of the late Robert Kardashian for some insight? Kim Kardashian Gets Invite To Met Gala: Kanye West Forces Anna Wintour’s Hand!, Click Here!